As the first “true” woodland plant that grew in the dry woods behind my newly acquired house, mitrewort has a special place in my heart. It prefers a moister, richer soil, and will not spread in my dry clay and rocks, but I can sow the seeds myself, and plant out seedlings to expand the clump. They will survive, but I will never have the swaths of delicate white wands that I see in our rich woodlands. So, I tend to notice them in the wild, whether they are in drifts or just a plant here and there. Mitrewort is not a very showy plant, even in flower, but a close inspection reveals delicate detail in the individual flowers. When not in flower, Mitella is easy to mistake for Tiarella (foamflower). 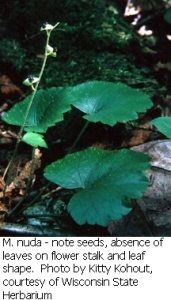 The leaves are a similar shape, size, and fuzziness. They are stalked, ovate, lobed, and toothed, resembling maple leaves. The flowering stalks though, are quite different. Depending on your point of view, Tiarella looks like a Mitella on steroids, or alternatively, mitrewort looks like a depauperate foamflower. But a drift of mitrewort backlit on a slope can be a bewitching site in early spring. We have two Mitella species in the Finger Lakes region - Mitella diphylla and M. nuda (naked mitrewort). The easiest way to distinguish these three species is the flowering stalk. 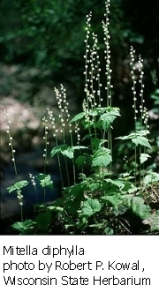 Unlike Tiarella or M. nuda, M. diphylla has two small, stalkless, opposite leaves on the flower stalk itself, above the level of the basal leaves. Naked mitrewort is smaller in every aspect (see below), less common, has rounder leaves, and blooms a bit later than M. diphylla or Tiarella cordifolia. Tiarella leaves are often wider than Mitella, and are more likely to have variegation. 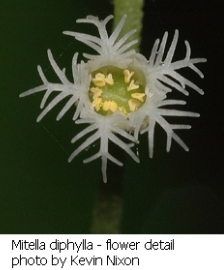 M. diphylla - 8-18 inches high with white 1/8th inch flowers produced between April - May; distribution - eastern North America (Ontario to Quebec, south to Arkansas and Georgia). M. nuda - 3-8 inches high with pale greenish white 1/16th inch flowers produced May-August in rich woods; distribution- northern North America (Washington to Pennsylvania north to Alaska, Nunavut, and Newfoundland). 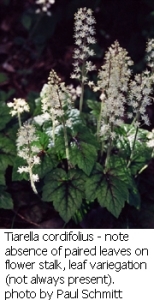 Tiarella cordifolia - 6-12 inches high with white ¼ inch flowers produced between April - June; distribution - eastern North America (Ontario to Nova Scotia, south to Missouri and Georgia). Cultivation: Mitella diphylla is easily grown in rich, moist soil in shade. The seed capsules split to leave small black seeds “sitting” in the cupped lower portion until they are spilled onto the soil. The seeds germinate readily after cold, moist stratification. All three species prefer somewhat acidic soil, but both M. diphylla and Tiarella cordifolia do well in my neutral - limey garden beds. Because M. nuda is much scarcer here, and because it seems to prefer cooler, wetter sites in our region, I have never tried to grow it.